How Long Does A Massage Takes? A massage is customized for the client. Depending on the massage service you select, your session can last as little as thirty minutes & as long as one hundred & twenty minutes. The benefits of a massage can: Alleviate low-back pain and improve range of motion. Ease medication dependence. Enhance immunity by stimulating lymph flow—the body's natural defense system. Exercise and stretch weak, tight, or atrophied muscles. Help athletes of any level prepare for, and recover from, strenuous workouts. Improve the condition of the body's largest organ—the skin. Increase joint flexibility. Lessen depression and anxiety. Promote tissue regeneration, reducing scar tissue and stretch marks. Pump oxygen and nutrients into tissues and vital organs, improving circulation. Reduce post-surgery adhesions and swelling. Reduce spasms and cramping. Relax and soften injured, tired, and overused muscles. Release endorphins—amino acids that work as the body's natural painkiller. Relieve migraine pain. The benefits will also increase with frequent visits. Sometimes we forget about the therapeutic properties that comes along with massage, because it feels like pampering. Make sure you include your massage appointments as a necessary piece of your health and wellness plan. Bodywork can enhanced sleep quality. Provide you with greater energy. Improve your concentration. Increase your circulation. Reduced fatigue. Bodywork gets to the root cause, and don't chase the pain. It also assist with mobility from repetitive injuries. 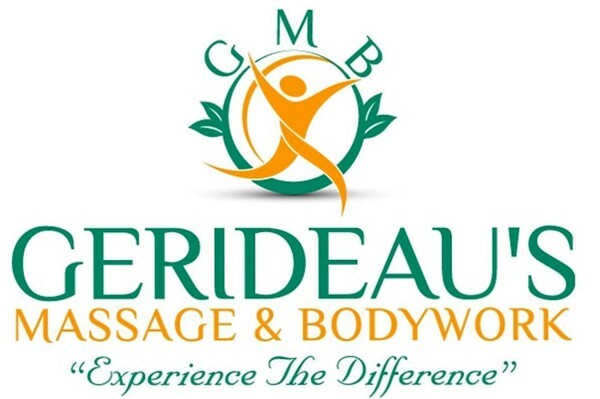 At Gerideau's Massage & Bodywork, we will work with you and create a treatment plan that meets your needs, budget and schedule. Give us a call, "Experience The Difference", as well as, learn how we can help you, be a better You! Currently, we do not accept insurance..
Do You Accept Flexible Spending Accounts/FSA? Yes, we do accept flexible spending accounts/FSA. Don't loose your benefits, contact us today and schedule an appointment. Do You Offer Mobile Massage? Do You Offer Discounts For Massage Services? We have competitive prices, however, certain times of the year we will offer a special promotion. We like to take care of our customers, if you purchase a package, you will receive greater discounts. Give us a call, to verify current promotions. What Is Clinical Neuromuscular Therapy? Clinical Neuromuscular Therapy (CNT): is a form of bodywork that targets and treats soft tissue to help improve joint and muscle function, rehabilitation, and pain management. Beneficial for muscles and joints have been repetitively overworked, strained, or traumatized. CNT improves posture, & enhances post operative rehabilitation, it also promotes deeper and easier breathing. CNT is more medical for correcting the problem area, opposed to chasing the pain. Who Would Benefit From Rossiter Workouts? Rossiter workouts are very intense, however the benefit of 50-80% pain relief in one session is the reward. Those individuals that suffer with severe to chronic pain benefit most from this bodywork. (In order to participate in Rossiter Workouts, you have to be able to get up and down on floor on your own. That depends on the individual, your activity, and severity of injury. Some professions require the constant use of muscles, and if this is the case, maintenance will help keep you out of pain.